I've been poking at this historical tileset of Oakland lately. 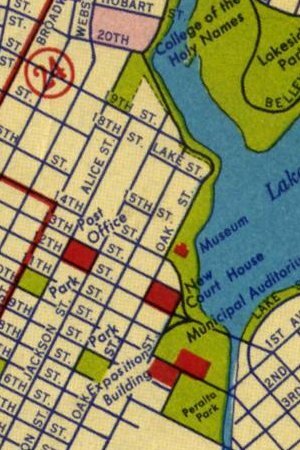 Last time, I posted slippy maps of Oakland in 1877, 1912, and the 1950s. I recently acquired a 1936 Shell map of the bay area that filled in a time period I was interested, the pre-war years when the Bay Area started to make the transition to an automobile society but hadn't yet been experienced the military base explosion of World War II. The visual treatment completely changes from the 1912 layer, starting to seem modern and borderline cartoonish. The progressive infill of Middle Harbor (just south of the Bay Bridge) visible over the years. The differences in highlighted driving routes between the 1930s and the 1950s, in particular the introduction of Macarthur Boulevard and West Grand Avenue. Still not a lot of trains shown on the second driving map. The Bay Bridge construction is apparently still underway, it opened in November 1936. I'm starting to get better at quickly processing these layers from scanned images. The new one is a bit blurrier than I'd like, possibly due to the crappy Epson scanner I'm using here. Anyone within biking distance of Oakland or SF have a better scanner I can use to re-do the driving maps? The next layer I want to get is something from the 1970s, maybe the 1980s - I'm keen to show the pre-Earthquake raised freeway structures that were ramrodded through West Oakland at the time.